Oops! Between the turkey and the pie, we forgot to post this meditation yesterday! The year comes full circle. November is the month of death. 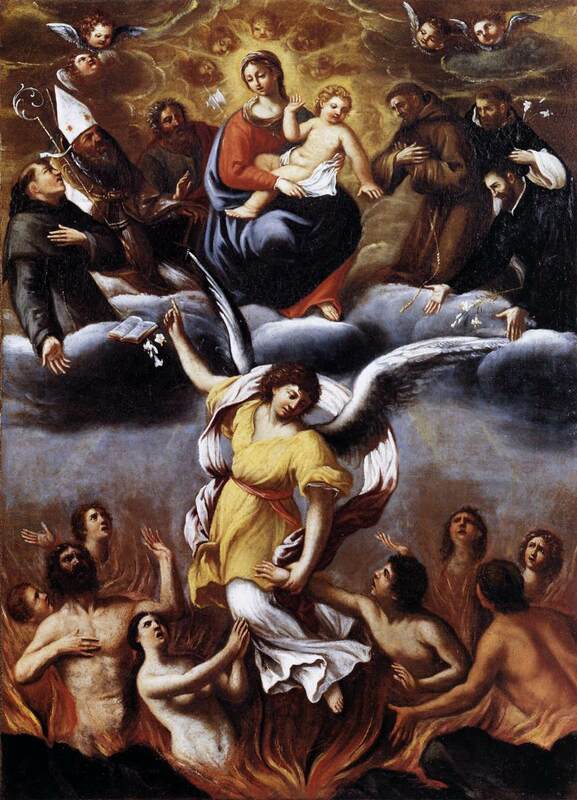 Liturgically we look to the saints in heaven, think of those in Purgatory, and think of the year as ending. Outside the world is gray and dying. But at the end of this month of ending comes Thanksgiving – because the time of death is also the time of harvest, and thanksgiving for the year behind us. So too do we end the year with Christ the King, pointing to judgment, yes, at the end of this life – but more directly to the great kingdom which is to come, the new beginning. And thus too Advent: a time of penance, a time of thinking about the end of the world, as things grow darker and colder still – but more than that, a time of preparing for the new birth at Christmas. Perhaps it’s odd to ponder the Dies irae – day of wrath! – between turkey and pie, the Macy’s parade and the football game. But the Dies irae itself sees “the day of wrath,” “the day of reckoning,” “that tearful day,” “when there will be trembling, when the judge will come, to make a strict accounting,” finally in terms of hope. Right in the middle, the Rex tremendae majestatis, king of majesty that makes us tremble, is also, in the very next line, the one who saves gratuitously, and in the next, the fons pietatis, wellspring of family feeling, pity, mercy. Two stanzas later we contemplate Christ “sitting forsaken,” not as an image of wrath, but as redeemer: “let that work not be in vain!” And the final word of the poem is not anger or judgment or tears, but peace: dona eis requiem. The Dies irae teaches us to tremble, but it also – more profoundly – teaches us to give thanks, for so great a redeemer, the bringer of hope and love and peace. The central image is that we will finally look on the face of Jesus, a central meditation of the Middle Ages. Now strictly speaking, the object of the beatific vision is not the humanity of Christ but the Triune divinity. It is not his human face that will finally make us happy, but his divinity. But we mustn’t drive too strong a wedge between, and the piety of the Middle Ages emphasizes looking on his face – just as, in John’s Revelation, we always see the one seated on the throne (the divinity) together with the Lamb who was slain (the humanity of Christ). So the magnificent Salve Regina (c. 1050) culminates “Et Jesum, benedictum fructum ventris tui, nobis, post hoc exilium, ostende”: after this exile, show us the blessed fruit of thy womb, Jesus – underlining his humanity. And the equally magnificent Ave Stella Maris (800s? )concludes all its prayers for this life with “so that, seeing Jesus, we may ever rejoice with him.” We long to see his face. It then inserts two verses about him coming to save us – “Remember that I am the cause of your journey . . . suffering the Cross, you redeemed . . .” – as if to underline the aspect of gift in Matthew 25:34, “then the king will say to those on his right, come, blessed of my Father, possess the kingdom prepared for you.” Matthew’s commands must always be read in light of the grace of redemption. And it culminates with the sheep and the goats (Matthew 25:32-33), including some frightening thoughts about the flames, as Jesus says to the goats, “depart from me into the eternal fire prepared for the devil and his angels” (Matthew 25:41). All of this draws us deeper into Matthew 25’s image of standing before the face of Christ: “when did we see you hungry?” (v. 37). What is judgment? It is nothing else but standing before the poor face of Christ and giving an account of how we have loved that face in this life. An accounting of our deeds, yes. But more than that, an accounting of how we have loved the human face of Christ, in its most distressing disguises. How can we learn to embrace that face? In the end, all is Jesus. We beg Jesus to help us to see his face in this world, so that we can rejoice to see his face when this world ends. What does “Christ-centered” mean in your prayer life?